Do you ever eat out with people in restaurants or cafes, and the people you are with order the smallest of salads or custumize-order a regular dish in a way so that's basically nothing left? Or when they order a regular dish, they tell you they feel full after having eaten less than half of it? At the same time, these people don't look like they survive easily on cucumber and celery sticks. Many people seem to produce awkward manners when eating in public. They feel obliged to show a huge amount of self-control when it comes to food choices and portion size when they are feeling watched. What are they trying to prove? A salad made of green leaves and fresh veggies may be healthy lunch choice. But every fool knows it will not last you until dinner. So prevent the mid-afternoon trip to the bakery next door, to the soda machine or avoid the chocolate drawer at your desk by having a square meal. That should apply to all meals in the day. Each of the three big meals should last you roughly or with just a small snack in between to the next big meal. It's proven that skipping a meal will just make you over-proportionally hungry at the next mealtime and you are more than likely to overeat. That gets you back to Square One. It takes a bit of discipline to stick to three main meals per day. But it should be the rule with just the occasional exception. It's not always practical as people commute, have busy jobs, kids to drop off and pick up, and family and other commitments. Here is my offer for a square salad that is still light enough tio be enjoyed on warm summer days but has enough substance to last you through an afternoon. Earthy lentils, tart pomegranates with fresh cucumber and a good handful of chopped toasted walnuts held together by a tahini lemon dressing. I find the layers of flavors and textures absolutely tantalizing. I hope you do to. And please, tell me that you eat square meals, made out of good and real ingredients! Place lentils, water bay leaf and a dash of salt in a medium saucepan. Bring to boil, then simmer until lentils are cooked, about 15 minutes. Drain and remove bay leaf. Meanwhile, deseed the pomegranate. Keep a bowl of water ready. Cut the pomegranate into quarters lengthwise. Submerge one quarter of the pomegranate in the water bowl, pull apart the skin and nudge out the seeds into the water. Repeat with the other quarters. Little pieces of skin will float on top. Take these off before draining off the water. Set aside. To make the cucumber ribbons, use a box grater and its largest hole. Cut the ends off the cucumber, then push lengthwise along the top of the grater, in long strokes for long, thin ribbons. Set aside. In a small bowl, combine tahini, olive oil and lemon juice. Whisk vigorously until well combined. The dressing may look curdled. Just whisk more. Add water until dressing reaches desired consistency. Season with salt and pepper. 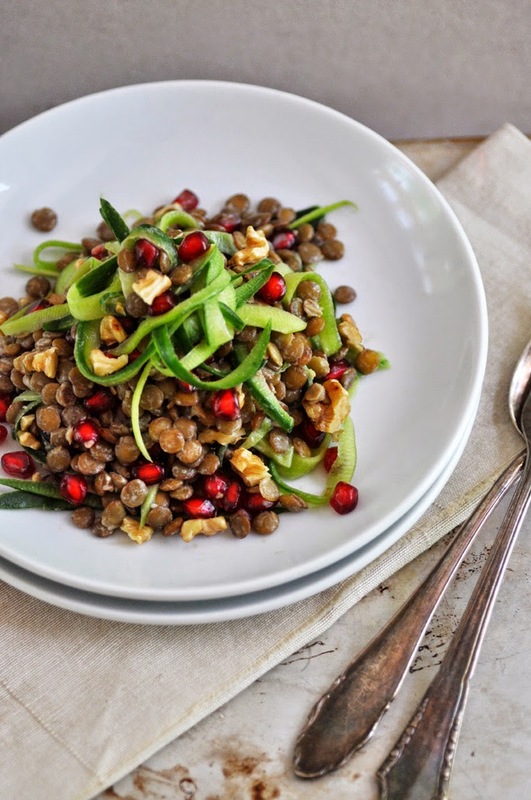 In a salad bowl, combine cooked lentils and pomegranates. Stir in the the dressing until salad is well coated. Gently fold in the cucumber ribbons. Sprinkle over the roasted walnuts. Serve cold or at room temperature.